The drug controller general of India, or DCGI, and pharmaecutical industry representatives decided at a meeting on 1 October to form the panel. DCGI Surinder Singh will head the panel that will also include Y.K. Gupta, chief of pharmacology at the All India Institute of Medical Sciences, and R.K. Sanghvi, chairman of the medical sub-committee of industry body Indian Drug Manufacturers’ Association. Gupta and Sanghvi made a presentation at the meeting where they segregated the combination drugs into different therapeutic groups. The panel will meet once every two months to deal with each group. The meetings, the first of which will take up 49 drugs, will start from 28 November, Sanghvi said. The final batch will be taken up in August 2009, and a list of drugs that are found fit to be marketed will then be handed over to the Drug Technical Advisory Board for clearance. The combination drugs— created by mixing two or more molecules that could cure multiple ailments through a single medicine—were among 294 drugs that DCGI ordered withdrawn from the market late last year, drawing protests from the industry. The regulator and the pharma industry have settled differences over 138 combination drugs, with some returning to store shelves and some withdrawn. The 294 drug combinations made for combined sales of Rs3,500 crore a year. 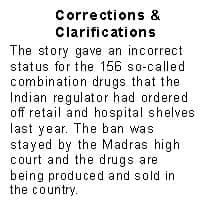 The industry opposed the blanket ban, asking DCGI to let the drugs stay on in the market until their safety and efficacy is investigated and then, if required, phase out some of them.